Located on the extreme northeastern tip of Nantucket, in the Coskata-Coatue Wildlife Refuge. Public access to the tower and surrounding grounds is allowed from the park's Rangers on many of their tours during the summer months. 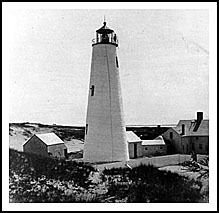 Great Point Light (also known as Nantucket Light) was built in 1785, to help mariners navigate the passage between Great Point on Nantucket Island and Monomoy Island at Cape Cod. The lighthouse sits several miles up a thin area of beach. When the lighthouse was first built, there was not a keeper’s house built with it for many years until 1825. This forced the early keepers to either walk or get to the station on horseback, which was a distance of seven miles, or they had to use a boat to arrive at Brant Point to get food and supplies. One Keeper, Jonathan Coffin, petitioned directly to the Secretary of the Treasury, and was allowed additional "hardship pay" for making the 7-mile journey. The original tower was destroyed by fire in 1816, and a new stone tower was built in 1818. In 1857 the lighthouse was furnished with a Fresnel lens and an Assistant Keeper's building. Between 1863 and 1890 there were 43 wrecks near the lighthouse due many believe, to confusion with the Cross Rip Lightship nearby. On September 23, 1931, Keeper Chase and Assistant Keeper Walsh at Great Point saved the crew of the fishing schooner Elizabeth Foley when the vessel caught fire two miles from the light. In March 1984, a severe storm destroyed the 1818 constructed lighthouse. In 1986 with the help of Senator Edward M. Kennedy, enough federal money was set aside for the building of a new Great Point Lighthouse, 300 yards west of the site of the old tower. Those who are adventurous, you will find the south shore beaches inviting. These southern shore beaches face the open ocean and provide the most dramatic surf. Be wary as these beaches can have dangerous rip tides. Cisco Beach and Surfside Beach are popular with surfers. 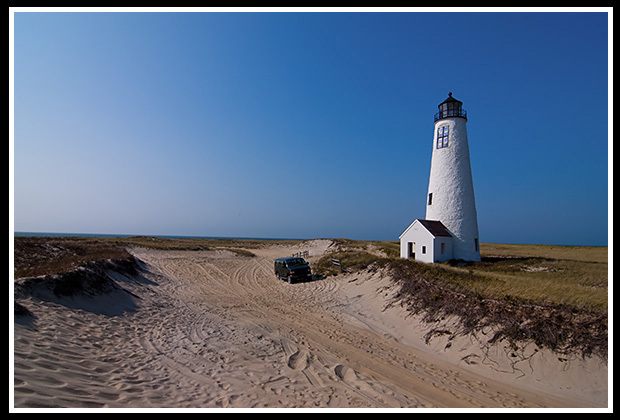 The eastern shore beaches are usually ones that are off the beaten path where you would need a permit, like the Great Point and Coatue beaches at Coskata-Coatue Wildlife Refuge, where Great Point Lighthouse is located. Kayakers, and those who may want to learn to windsurf, frequent Pocomo Beach. It's nearly impossible to visit Great Point Lighthouse without arriving by boat or 4-wheel drive vehicle. During the summer months the Trusties of Reservations offer tours of the Coskata-Coatue Wildlife Refuge. Here a naturalist guide will lead you on an over-sand vehicle tour through the salt marsh to learn about the geology, ecology, and history of the area and, then you get to climb Great Point Lighthouse tower for some spectacular views. This is such a great tour and I guarantee you'll be glad you went and explored this area. To reach the wildlife refuge from the Steamboat Wharf in Nantucket, proceed up Broad Street to South Water Street. Turn left on South Water Street and then turn right on cobble-stoned Main Street. From Main Street, turn left on Orange Street and continue on Orange Street for just over a mile to the rotary. At the rotary, go east on Milestone Road for almost half a mile, and then turn left onto Polpis Road. Follow Polpis Road for four and a half miles, and then turn left onto Wauwinet Road. Continue on Wauwinet Road for just over two and half miles, where you will see the Wauwinet Gatehouse for the the Coskata-Coatue Wildlife Refuge. Most of the cruises mentioned below involve ferry service to take visitors to the islands from either the main land or between the islands. Most of the ferries mentioned don’t pass by the lighthouse, but provide services to get to Nantucket Island. Tours of great Point Lighthouse and the wildlife refuge area. 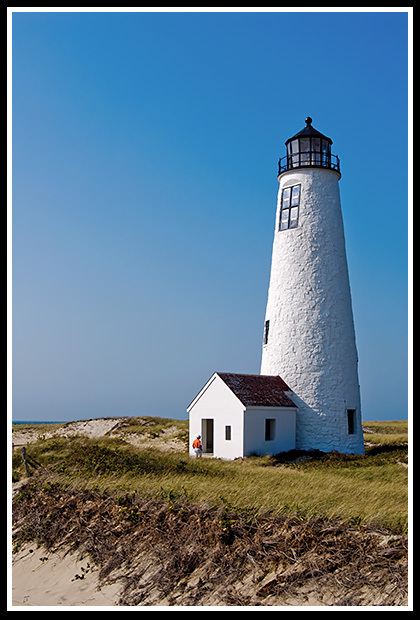 Offers guided van tours around Nantucket Island. 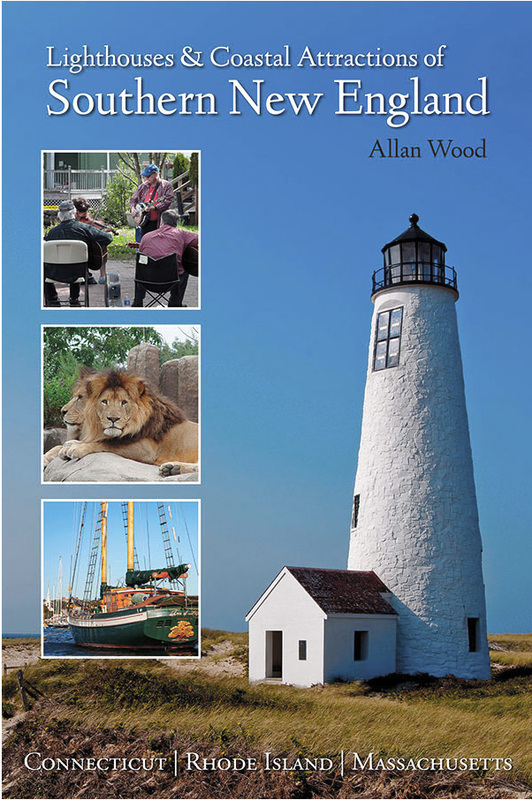 Explore this 300-page book where you'll find over 360 photos and map illustrations, with plenty of stories and things to do around each lighthouse. Great Point light is on the cover too!